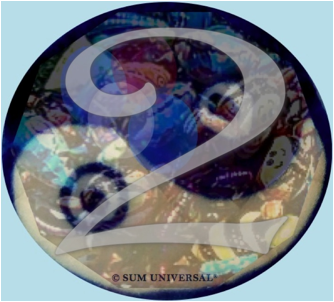 Number two embodies the qualities of creativity, receptivity, and productivity while working in a complementary and/or opposing setting to bring about harmony and/or justice through mediation. Number two symbolizes dualism, the basis for movement and progress, in myriad forms and processes: neither matter nor energy can be destroyed, but they can be transformed to another form; two concepts are needed for change or transformation to take place in nature: matter and energy; two kinds of nuclear reactions: fusion (hydrogen bomb) and fission (atomic bomb); two types of elements: non-radioactive and radioactive; electrical current exists of two charges: plus and minus; the smallest detectable elementary particles for example, the photon, can exhibit two states: wave or particle (this is called the complementary principle); rule of two: two electrons in the outer electron shell ("duet" rule, known as stable Helium configuration); elemental change occurs either in the outer atomic electron level or atomic nucleus leaven; chemical change occurs in nature when two opposing elements are combined; chemical reactions take place when two of these events occur: electrons are either gained/lost, or shared; two electrons in the same shell have opposite spins; two forms of matter on Earth: organic and inorganic substances; material is either homogeneous or heterogenous; DNA and RNA, which are interdependent of each other, are the building blocks of the complementary double helix structure of human life. The chemical element that correlates with number two is the non-metallic element helium, which is the second most abundant element in the observable universe, though only very little helium is found on earth. It is a colorless, odorless, tasteless, non-toxic gas, lighter than air, but heavier than hydrogen, and it is in contrast to hydrogen not flammable and not very active. Therefore it is commonly used as a lifting gas in balloons and airships. Helium belongs to the very inactive noble gases with two electrons on their outer shell, which establishes a stable configuration for the atom. Because of its low boiling point, low density, low solubility, high thermal conductivity, or inertness it is used for many industrial and scientific purposes that require some of its unique properties.